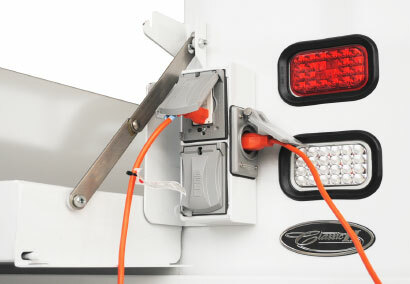 Redi-Gate is the same height and width as the iconic Reading tailgate, and only 2” deeper. 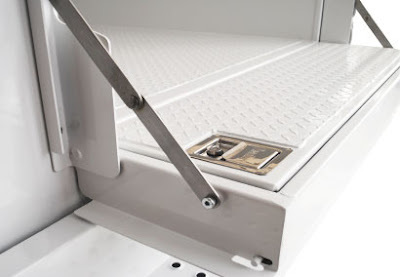 Redi-Gate’s lockable compartment door is concealed for added security. Available as an option on Classic II service bodies. Over 1.1 ft3 of additional storage space for tools, accessories and more. Looks like any typical tailgate when closed. When deployed, it sits flush to the cargo floor for safety. Redi-Gate offers convenient space to store smaller equipment to free up side compartments for larger tools and work gear. Redi-Gate EXP model adds four (4) 125V weather-resistant GFCI outlets. Connects easily to an inverter or power source for on-site power. Redi-Gate’s innovative, patent-pending design is EXCLUSIVE to Reading. Built from heavy duty aluminum and stainless steel hardware for durability.